June is a busy multi-birthday month for us, so when we needed a couple of birthday cakes we thought of Cassis Bakery in Beverly. Since its inception 10 years ago, Cassis has won many accolades and become well known on the North Shore for its pastries and wedding cakes. We stopped in last week to peruse the refrigerated cases and order our confections. The bakery offers a wide range of cakes and tortes to choose from, including a new gluten-free menu. Our first request was a Sacher torte, but we were told that due to time and complexity, the baker no longer makes them for small orders, and even when ordering a large one, it must be done further in advance. So we decided to go with a fruit flan and a standard chocolate mousse birthday cake. The beautiful display in the pastry case was so alluring that after we placed the order, we couldn’t leave without taking a few treats along. The porcupines ($2.85) were so damned cute that you almost don’t want to eat them—but we did. A butter cookie tart shell filled with chocolate cream, almonds, and a coat of dark chocolate, they tasted as wonderful as they looked. The cinnamon twist ($2.20) was also quite good; like an elongated cinnamon bun with plenty of icing, it was lovely with coffee. When we picked up the cakes on Sunday morning, everyone was wowed by how gorgeous they were. The fruit flan ($37.50 for 9″) was spectacular. Completely unlike supermarket tarts, the fruit was sliced thinly to make an intricate pattern and included fresh peaches, kiwi, strawberries, and raspberries. The tart shell was buttery, the flan itself rich and creamy. Although the chocolate cake ($30 for 8″ plus $3 for the purple frosted decorations) was beautiful, flavor-wise it was unsuccessful. The sponge cake was a dry and not chocolate-y enough, though the layers of mousse in the middle helped it, and the buttercream frosting was heavy and bland. 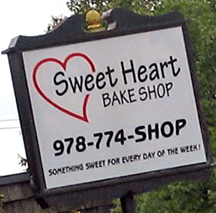 We sampled several treats from the new Sweet Heart Bake Shop in Danvers Square yesterday, and although some were quite good, others did not meet our (admittedly) high standards. Sweet Heart is a tiny space offering everything from egg sandwiches and fruit cups in the morning to subs, sicilian pizza squares, and quiche for lunch and dinner. Breakfast pastries include muffins, coffee cake, and mini breads (banana, pumpkin, zucchini). We sampled a poppyseed muffin with lemon glaze ($1.50) with a dense crumb that was good but not great. In addition to cheesecake, carrot cake, and bundt cake, the shop offers cookies, cupcakes, and biscotti. We sampled the lemon square, brownie ($1.25), whoopie pie ($1), and a mini éclair ($2.25). The lemon square was terrific—just enough sweet to balance the tart, and great texture to the crust and filling. 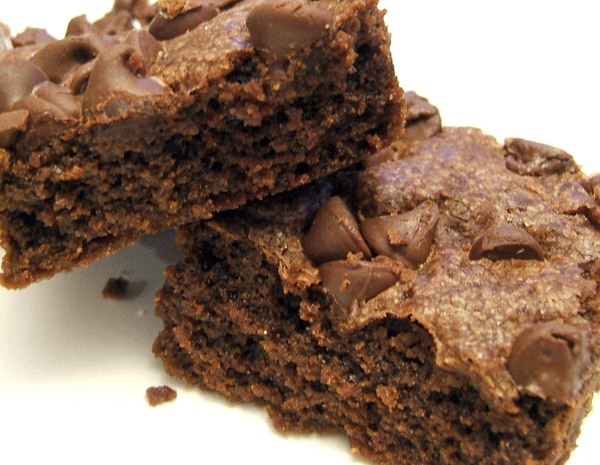 The brownie, topped with chocolate chips, was very good. It was large and fudgy without being overly dense. We were less impressed by the whoopie pie (the cake was crumbly and the filling was bland) and the éclair (flavorless filling and underbaked shell). If you’re in Danvers Square and looking for breakfast or lunch, Sweet Heart is worth stopping by to check out. Owners Jeremy and Joan Smith obviously care about providing their customers with fresh, quality food. The shop is still quite new, and as Joan (the baker) gets her feet under her, SweetHeart may become more of a destination than a drop-in. Up early on a recent Sunday, we decided to forgo the usual healthy breakfast and indulge ourselves. The place to do it? A&J King Artisan Bakers in Salem turned out to be an excellent choice. This bakery and cafe is warm and inviting with large bright windows, hammered copper tables, and of course, mountains of crusty loaves and glass cases full of tasty treats. There is a chalk board announcing the seasonal specials (Pumpkin Spice Brown Butter Cakes! Potato Gruyere Flatbread!) and which locally produced ingredients they are currently using. We decided to have coffee and pastry there and then take a few things home to try later. While the coffee was quite respectable, rich and dark but not bitter, the prices aren’t much of a savings over Starbucks ($2.70 for a Tall Latte, $3.26 for a Grande). My companion chose the pain au chocolate; I could not resist the siren song of the sticky buns. The chocolate croissant ($1.95) was lovely; well made with high quality chocolate, though it paled in comparison with the incredible sticky bun, a much more substantial pastry ($2.10). I am not exaggerating when I say that sticky bun was one of the best I’ve ever eaten. It wasn’t sodden and sugary as so many tend to be, but the perfect combination of flakey buttery layers, pulled away to reveal the wonderful caramelized cinnamon sugar that complemented the pastry but didn’t overwhelm it. While I prefer the female of the species (no nuts), A&J offers both varieties and even if you have to drive out of your way, the sticky buns are worth the trip. Later in the day, we sampled the baguette ($2.65) we had taken home, and it was terrific; crusty on the outside and yeasty, slightly chewy on the inside. I’d say Iggy’s (my regional favorite) has a real competitor on it’s hands. Needless to say, the loaf was demolished in short order. The final A&J treat sampled was the chocolate bouchon ($2.25), a mini dark chocolate tower-shaped cake. A perfect balance of flavors and texture; dark chocolate with a hint of almond, rich and satisfying without being heavy or cloying. Using the term artisan to describe Andy and Jackie King’s bakery isn’t just hip marketing. They have truly mastered an art; balancing sweet and savory with taste and texture to create incomparable baked goods.